You have no idea what you’ve wandered into. From the moment you stepped off the docks in Seyda Neen, you became a potential pawn in a grand power struggle between the Great Houses that govern this land and even between the living gods themselves and their terrible ancient enemies. But of course, if it maneuvers correctly, a pawn can become a queen. Who will you trust? Who will you fight for? Can you control the Houses of Morrowind? The Elder Scrolls: Legends is going to Vvardenfell with Houses of Morrowind, releasing March 29 on PC, mobile and tablet devices. 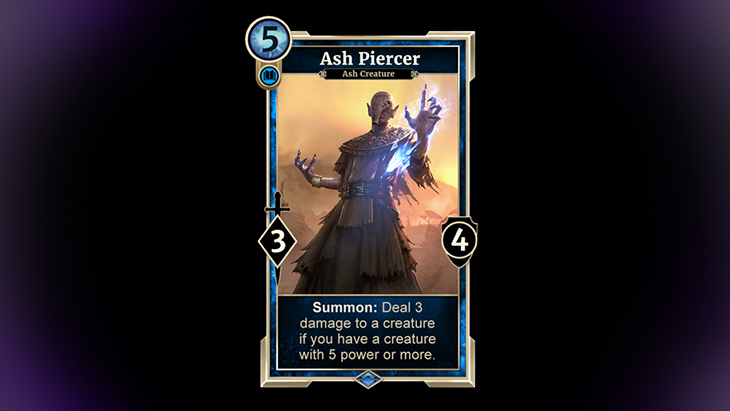 The set introduces 149 new cards to the game, featuring creatures, characters and many other familiar sights from both The Elder Scrolls III: Morrowind and The Elder Scrolls: Online. You’ll find the Great Houses and their machinations. You’ll find strange creatures like netches and hear the chilling cry of descending cliff racers. You’ll find the living gods themselves. And of course, you’ll find their nemesis – the mighty Dagoth Ur. What’s that? You can only play two attributes in a Legends deck, you say? Not anymore! Normally, a deck in Legends can only contain up to two attributes (or as they’re sometimes colloquially referred to, “colors”). 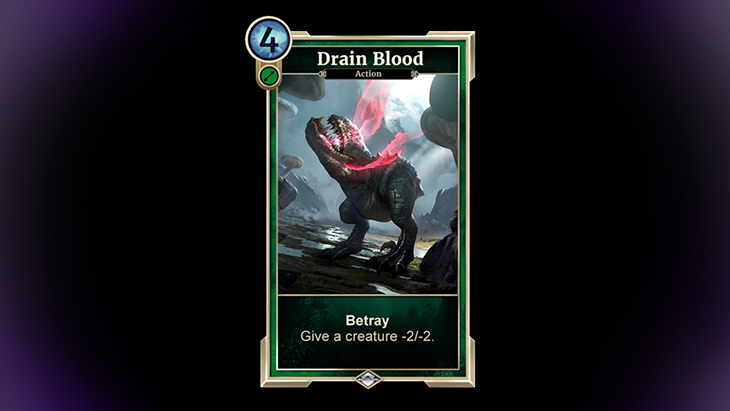 But Houses of Morrowind contains a handful of powerful new three-attribute cards that let you break that fundamental rule. Here’s how it works: When you put a three-attribute card like Dagoth Ur in your deck, you unlock the ability to use cards from all three of its attributes in that deck. Ever wanted to equip Tazkad with a Sentinel Battlemace? How about using Laaneth to fetch a timely Allena Benoch? In a Dagoth deck, you can. In exchange, you must include at least 75 cards in your deck. You may not play with cards of any other attributes. “But I thought the maximum deck size was 70?” Well, this is Morrowind – where new things are always possible! With the release of Houses of Morrowind, the maximum deck size is being raised to 100 for not just three-attribute one, but all decks. House Redoran reigns over Strength, Willpower and Endurance. To represent its military might, those attributes get the new keyword Rally. Whenever a Rally creature attacks, it gives a random creature in your hand +1/+1. 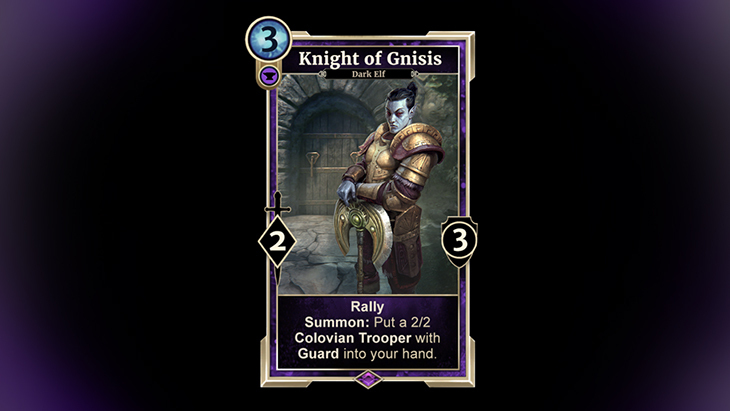 There’s a lot of creatures that can benefit greatly from being rallied to your cause, from guards like the one Knight of Gnisis gives you, to charge creatures like Nord Firebrand. Who will you bring into the Redoran ranks? 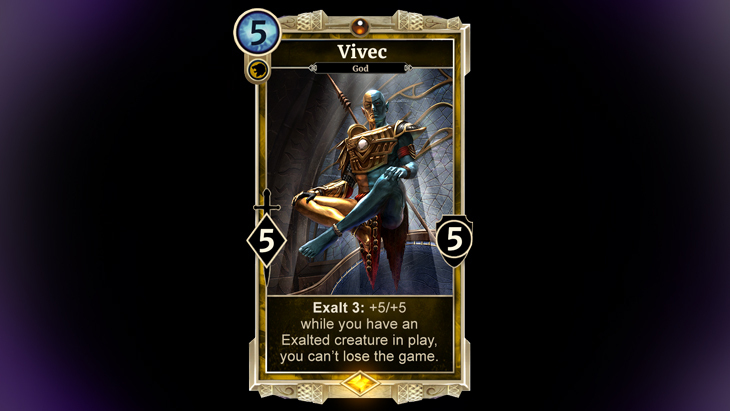 This ability is right at home in the Telvanni colors of Intelligence, Agility, and Endurance, all of which have access to creatures with powerful Last Gasp effects. Go ahead and backstab Balmora Spymaster, he can take it. Haunting Spirit will understand your betrayal – after all, she’s dead already! House Hlaalu is always up to something. This House has enterprises across Morrowind, and if it takes a little thievery, bribery, or strong-arming to make them succeed – hey, that’s business. The Hlaalu mechanic is Plot. Plot abilities trigger if you’ve played another card that turn. Hlaalu Sharpshooter here, for example, offers a better rate than Earthbone Spinner – but only if you can manage to play something else in the same turn. 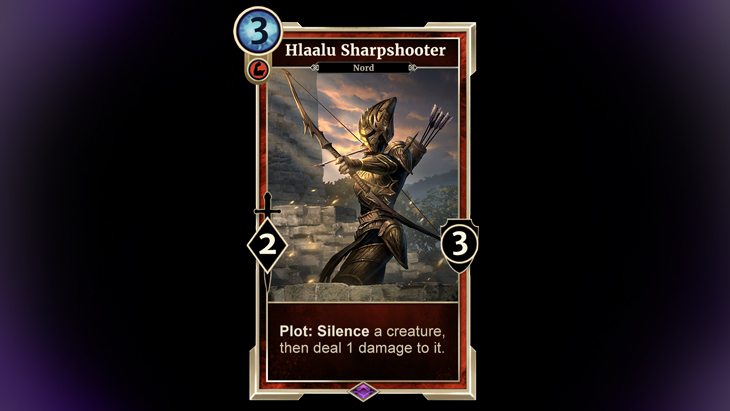 Luckily all three of Hlaalu’s attributes – Strength, Willpower and Agility – have lots of inexpensive cards that will help your plots come to fruition. The Tribunal Temple enacts the will of Morrowind’s living gods. This faction reveres the intelligence of Sotha Sil, the willpower of Vivec, and the endurance of Almalexia. In exchange, the gods bestow great power on the followers they deem most worthy. In Houses of Morrowind, that power is represented by Exalt. Exalt offers a creature a bonus if you pay more magicka for it. 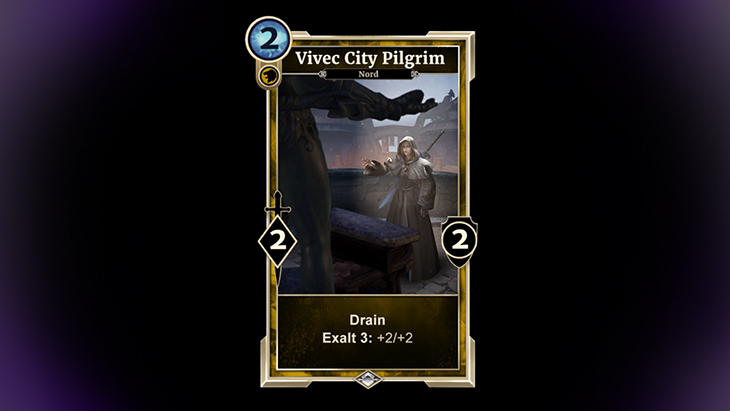 In Vivec City Pilgrim’s case, you could play her early – a 2-cost 2/2 Drain isn’t half bad – or you could wait, and make her a 4/4 for 5. Which brings us to our last faction – House Dagoth. The Tribunal attempted to destroy this house centuries ago, ensuring it was all but forgotten. But deep within the Red Mountain, Dagoth Ur has plotted his revenge and rebuilt his house – in the form of frightening beings known as Ash Creatures. As an outcast house of monsters, House Dagoth wants no part in the Great Houses’ political dance. Instead, it seeks raw power. 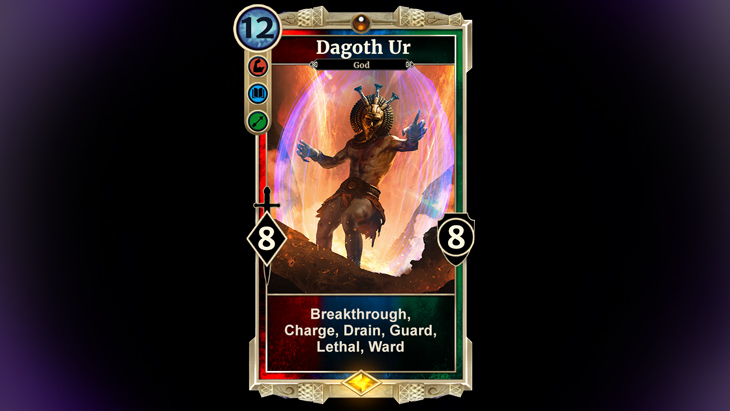 Dagoth cards, which you can find in Strength, Intelligence and Agility, reward you for having creatures with 5 or more power. Of course, that could be Dagoth Ur himself or one of his top lieutenants – but it could also be something like good old Blighted Alit. Rest assured, this is just the proverbial first step off the boat. Houses of Morrowind is packed with cool cards that promise to shake up Legends in a big way. Even if you decide not to swear allegiance to one of the houses by playing a tri-attribute deck, we think you’ll find plenty to explore and some new favorite cards for your existing decks. Stay tuned to your favorite content creators in the coming weeks for more reveals! Posted in App, Bethesda, Mobile, New, PCTagged Houses of Morrowind, The Elder Scrolls: LegendscommentLeave a Comment on The Elder Scrolls: Legends – Houses of Morrowind Launches March 28!